Xenoblade Chronicles 2 is the third entry in the Xenoblade series. 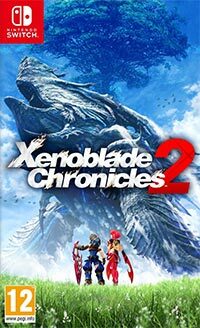 The previous entries were Xenoblade Chronicles for Wii and Xenoblade Chronicles X for Wii U.
Xenoblade Chronicles 2 is another entry in the popular series of RPG games developed by Monolith Software. The title was published by Nintendo as a SWITCH exclusive. Similarly to previous entries in the series, the title was directed by Tetsuya Takahashi. The story told in Xenoblade Chronicles 2 for SWITCH isn’t related in any way to the plot of the first entry in the series. The game takes place in Alrest – a fantasy world covered with a “sea of clouds”. Above these clouds there are Titans, creatures so big that there are whole settlements and vast realms placed on their backs. The whole world is centered on the World Tree – a powerful tree with the mythical Elysium at its top. Since the Elysium is considered a paradise, many factions are fighting each other in order to reach the mythical place before others do it. Suddenly, Rex, the main protagonist of the game, joins the race to Elysium. He was living on the back of one of the lesser Titans when a girl named Pyra asked him for help in reaching Elysium. He decided to help her and started a long and dangerous journey. His actions will place him in the middle of a greater scheme and in the end he will decide the future of the citizens of Alrest. The events in Xenoblade Chronicles for SWITCH are presented by using a third-person perspective. During the game the player is exploring various locations (on foot and on the back of friendly creatures), completing various quests received from non-playable characters, and fighting enemies by using a vast variety of regular hits and special attacks. The latter require filling a special bar before they can be used. The game also features an expanded character development system that enables the player to increase combat potential of the characters. In addition to the previously mentioned Rex, during the game the player also controls other characters known as Drivers. Each of them has unique character traits, look and combat skills. They are accompanied by Blades (one of them is Pyra) who can be summoned to the battlefield with “Core Crystals”. These creatures can be considered “living weapons”. Although the player can’t control them directly, their role on the battlefield is important – they support the warriors with Blade Arts, powerful abilities that can change the outcome of the battle. They can specialize in offence, defense and healing the allies. High quality three-dimensional graphics are a strong advantage of Xenoblade Chronicles 2 for SWITCH. The game features unique style and rich colors. A dedicated soundtrack that creates the atmosphere of a great adventure is worth mentioning as well. Game score 7.7 / 10 calculated out of 90 players' votes. Expectations before the premiere: 8.7 / 10 calculated out of 28 players' votes.